Valtteri Bottas has taken back-to-back pole positions after stumbling onto P1 at the season-ending Abu Dhabi Grand Prix. 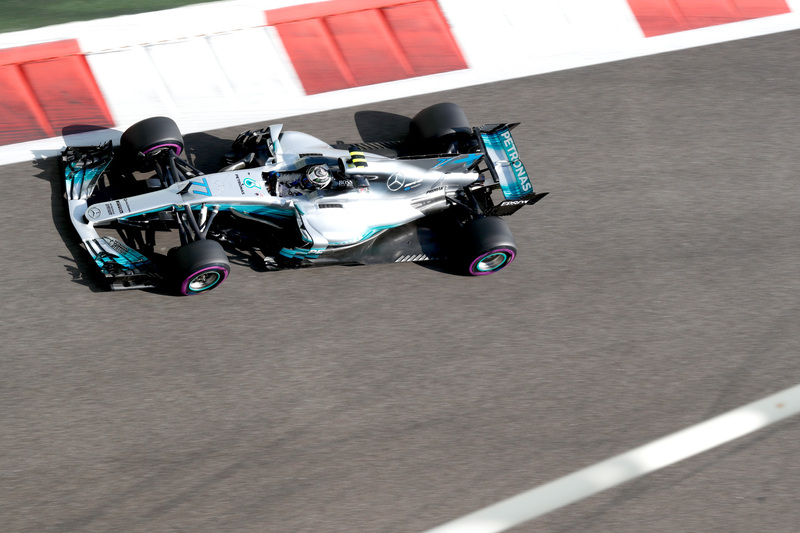 Bottas set provisional pole with his first lap in Q3, but the Finn knew from early in his final lap that he was unable to improve his time, returning to the pits as he rounded the final turn. Meanwhile Bottas’s teammate, Lewis Hamilton, was chipping away at his 0.172-second deficit and looked assured to seize P1, but a mistake exiting the final corner erased his marginal gains on the spot, handing the advantage back to Bottas. “What an incredible lap,” Hamilton conceded. “He just had an incredible qualifying, and congratulations to him. Fresh in Bottas’s mind as he lines up for his fourth career pole will be his poor conversion rate, with only one of his three P1 starts ending in victory. Last round in Brazil the Mercedes driver lost his pole position to a fast-starting Sebastian Vettel from the front row, but this weekend the Finn says perfecting his getaway will be a key focus. “I was so gutted in Brazil in the last race being on pole and missing the win,” he said. “I have a clear target for tomorrow. “Today things were really getting better and better for me. I just managed to find time. Sebastian Vettel will line up third on the grid for Ferrari, his best time half a second off Bottas’s headline time. “I think it was a good session,” he said. “Bit of a shame to be that far back, but tomorrow I think we can be a bit closer. Daniel Ricciardo leapt from sixth to fourth with his final qualifying lap, edging to within 0.2 seconds of Hamilton and pipping Ferrari’s Kimi Räikkönen by less than 0.02 seconds. Max Verstappen, who struggled with set-up for most of the weekend, qualified 0.25 seconds behind Räikkönen in P6, but the Dutchman was a second ahead of Renault’s Nico Hülkenberg. Sergio Perez led Esteban Ocon by 0.23 seconds in eighth and ninth, and the duo was 0.2 seconds ahead of Felipe Massa in the Williams driver’s final Formula One qualifying session. McLaren fought strongly to make it through to the top-10 shootout in its final race weekend with Honda, but Fernando Alonso, who occupied 10th for much of the session, was bested by 0.07 seconds by Williams’s Felipe Massa at the death. Behind Alonso in P11 qualified Renault’s Carlos Sainz, the Spaniard 0.6 seconds behind his top 10-bound teammate Nico Hülkenberg. Sainz, however, was suffering from power unit problems during the session, which prevented him from setting a final competitive time. Stoffel Vandoorne put the second McLaren in P13, ahead of Haas’s Kevin Magnussen and Williams’s Lance Stroll, whose best Q2 time was more than a second slower than Felipe Massa. Toro Rosso struggled as the sun set on the Yas Marina Circuit. F1 rookies Pierre Gasly and Brendon Hartley battled with Sauber drivers Marcus Ericsson and Pascal Wehrlein despite the Swiss team labouring with year-old Ferrari engines. Toro Rosso needed a strong performance this weekend to continue its defence of its slender four-point lead over Renault and six-point lead over Haas for sixth in the constructors standings, but neither of its drivers were able to set a competitive lap by the time the flag fell on the session. Hartley, who carries a 10-place power unit penalty, was slower of all, with Ericsson starting alongside him on the back row of the grid, and Gasly led Wehrlein in P17 and P18 in what is shaping up to be the latter’s final F1 race weekend in the foreseeable future. Williams’s Lance Stroll pipped Haas’s Romain Grosjean in the final seconds of the session, relegating the Frenchman to P15.